This recipe courtesy of Michel Trama ( www.aubergade.com ). Make up the vanilla oil at least one week before. Mix together the oil, vanilla and salt. Put in the fridge for a week. Bring the coconut milk to the boil. Add the turmeric, Tom-Yam, lemon grass, ginger and let them infuse for 30 mins. Bring to the boil once more and add cornflour to thicken. Strain. This is a delicate operation which requires attention to monitor the strength of the spices in the milk – it would be advisable to experiment first. Also, it may be a way to alter the recipe in a subtle way to accommodate other wines in the same style. Cut the lobster into pieces and season. The texture of the lobster is altered by the size of the chunks. 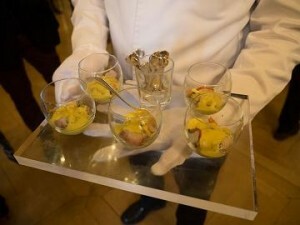 Other Sauternes or wines from Barsac might benefit from a different size of lobster piece. Dice into small chunks the carrots and courgettes along with a spring onion. Place the raw vegetables in the bottom of a hot bowl. Place the lobster on top and pour the hot sauce over the top. Grate a kaffir lime and sprinkle with the chopped coriander over the top. Pour over a small amount of the vanilla oil just before serving.